ORLANDO, FL--(Marketwired - July 13, 2016) - IZEA, Inc. (NASDAQ: IZEA), operators of IZEAx, the premier online marketplace connecting brands and publishers with influential content creators, has partnered with Federated Media (FM), a pioneer in the integrated media and content marketing space, to expand its influencer marketing offering for high-caliber brands. "Since its founding, Federated Media has been known and trusted to identify some of the best influential content creators and connect them with brands to create high-touch content experiences for audiences across multiple platforms," said Ryan Nathanson, VP, Digital Strategy, at Federated Media. "These experiences have resulted in dozens of industry awards and greater return on advertising spending each year for Federated Media, influencers and brands. Our partnership with IZEA is significant in two primary ways. First, IZEAx allows us to continue to lead the content strategy industry in discovering and offering top influential talent across platforms so we match the right influencer to the right campaign. This gives our customers confidence in knowing FM has the capability and purview to tap into the largest universe of influencers for their campaign. The second is IZEA applies a philosophical and metric driven approach to influencer quality control and ranking that provides richer insights from data and more efficient marketing." Ted Murphy, Chairman and CEO of IZEA, commented, "We look forward to working with Federated Media to enhance their distribution and intelligent content strategy for their clients. The IZEAx marketplace will benefit from FM's premium brand and influencer relationships, creating more opportunity for the entire ecosystem." Federated Media offers a comprehensive content journey solution, from the creation of branded content to distribution to drive awareness, engagement and conversion. Each stage of this journey is amplified with data and proprietary social tools to maximize a content marketer's campaign performance. IZEA will make available to Federated Media its network of over 650,000 social connections for creators ranging from A-List celebrities and Vine stars to mommy bloggers. Since 2006, IZEA's marketplace has facilitated over 3.5 million transactions between brands and creators -- by far the most experience in the space. IZEA social media influencers reach over 3.9 billion aggregate friends and followers through blogs, Twitter, Instagram, Vine and other social channels. Today, 84 percent of brands say they plan on using social media influencers to boost marketing efforts in the next 12 months, and of the brands that already have an influencer strategy in place, 81 percent are satisfied with the results, according to Adweek. 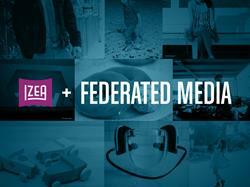 Federated Media, a Media General company, is a premium publisher community that drives engagement for brands through pure native, intelligent content and advertising solutions with accelerated reach using its proprietary social media buying offering. As a pioneer in content marketing, Federated Media is a trusted partner connecting brands to a community of high-quality and authentic content producers with an audience of 240 million consumers. Federated Media provides high-quality, innovative advertising solutions across all screens and devices, through the use of proprietary social technology, amplified for digital and TV. The company is headquartered in New York City with offices in Chicago, Austin, San Francisco, El Segundo, CA and Hermosa Beach, CA. For more information, visit http://www.federatedmedia.net/ or follow on Twitter @FMP. IZEA operates IZEAx, the premier online marketplace that connects brands with influential content creators. IZEA creators range from leading bloggers and social media personalities to A-list celebrities and professional journalists. Creators are compensated for developing and distributing unique content on behalf of brands including long form text, videos, photos and status updates. Brands receive influential consumer content and engaging, shareable stories that drive awareness. For more information about IZEA, visit http://corp.izea.com. This press release contains forward-looking statements within the meaning of Section 21E of the Securities Exchange Act of 1934. Statements in this press release that are forward-looking include the company's estimated levels of bookings, revenues, gross profit margin, expenditures and net operating loss for the 2016 fiscal year. These forward-looking statements are based largely on IZEA's expectations and are subject to a number of risks and uncertainties, certain of which are beyond IZEA's control. Actual results could differ materially from these forward-looking statements as a result of, among other factors, competitive conditions in the content and social sponsorship segment in which IZEA operates, failure to popularize one or more of the marketplace platforms of IZEA and changing economic conditions that are less favorable than expected. In light of these risks and uncertainties, there can be no assurance that the forward-looking information contained in this respect will in fact occur. Please read the full statement and disclosures here: http://corp.izea.com/safe-harbor-statement.